I decided to add this Judges post separate from the Bible lesson because I just kept adding to it! There is so much you can do with Judges! So, I will start with the lapbook. I made this very basic so that you can add as little or as much info as you want. Here is the cover, and as you can see, I kept the file folder the same design and did not refold it like I normally do. And, that is because of how I made the front cover. That is one of the great things about lapbooks. You can change anything to make it fit your needs and it is ok! So, this is how I put the inside together. I really made the scripture for the inside, but once I cut everything out, the parts fit perfectly, so I glued the scripture to the back. If you decide to lay out your lapbook like this, I put everything where I wanted it, then glued the parts down around the outside. Then I knew how much room I had to fit the rest in. Again, I didn't create any tricky cutting or anything, so it is easy for the kids to do themselves. Click here to download and print the lapbook. I also made this 2 page worksheet, which is what I am going to use. I started with the lapbook, then decided to just make worksheets. I made a section for each judge, and the kids can write in whatever you decide. I will just have them write in how many years they were a judge. You can print it in color or in black & white. And, the last option for this post is a Judges bulletin board. I thought it would be easier to have the basic info of each judge up while I teach this quarter. I like to review what we have been studying, so I can go to the board and point and talk! I will add a star or arrow for each judge when I teach each lesson. These can also be used as visuals, which I am printing 2 sets for. I am not permitted to change the graphics, so I added longer hair for Samson on mine. That is an option to help the kids remember if you decide to. Print it here. 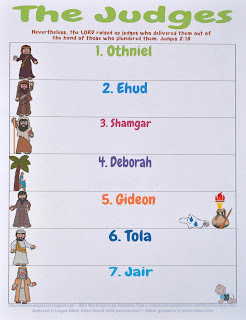 Why isn't Abimelech listed as a judge in the printables? After a lot of study on the judges, I did not add Abimelech as a judge. But decided to add this comment as to why, after I received several comments. My main reason is the Bible verse: Nevertheless, the Lord raised up judges who delivered them out of the hand of those who plundered them. Judges 2:16 God picked who He wanted as the judges, and the first couple of verses of chapter 9 tell us that Abimelech talked bullied his way into being a leader, and is made 'king' by the men of Shechem (9:6). In verse 22, we are told that Abimelech ruled for 3 years. Again, he was self appointed and considered himself a ruler. After a lot of time spent on this, I can't get past the fact that God didn't pick him to be a judge. Please read the article below for a fantastic bio about Abimelech written by Dave Rogers, the Minister at Fayetteville Church of Christ in Fayetteville, Georgia. With the financial backing of his mother’s kinsmen, Abimelech hired a group of thugs to assist him and then brutally executed all of his half-brothers except Jotham, who managed to escape. 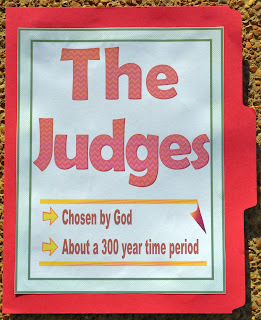 Judges 9:22 says that Abimelech “reigned” (a word which means he exercised power, acting as a kind of “prince” or self-appointed “royal personage”) over Israel for three years, but it is important to note that the Bible never calls him a judge, nor does it ever imply that he acted with God’s authority. In fact, the very opposite seems to be clear, since the account of his actions in Judges 9 makes it plain that God’s intentions for Israel were contrary to Abimelech’s ambitions (cf. Judges 9:23-24 & 56-57). Thank you Dave Rogers for writing about Abimelech and permitting me to post it here. I was wondering if you use a color printer at home or do you have one at church for your printables? Thank you for your wonderful ideas! Sorry it has taken so long to reply! I have been moving! I use a printer at home, especially when I am printing stuff for the blog. I usually make workbooks for the students so they get the papers if they are not there, and those are by the quarter or subject (Acts is over 2 quarters) and I hand the stack to the church secretary and she prints them for me. Most of the projects I just print at home. Sorry, it's not really a firm answer! Anyway, thanks for stopping by and leaving the comment! Thank you for the wonderful visuals concerning the book of Judges! There were a couple of errors that I wanted to mention. On the bulletin board set there is an error on the Ibzan page. The verses should be Judges 12:8-10 and not 11:8-10. On Jair's page, he judged 22 years and not 23 years. Thank you again for your visuals and lesson ideas. My friend and I have really benefited from your ideas! Thanks so much for the corrections! They are updated. I appreciate it! Thank you for the great visuals and bits of information! I recently did a Judges bulletin board, and I had a difficult time finding images of the "rarer" judges. I will certainly keep this post handy for the next time. You do a wonderful job, as always, and I very much appreciate your hard work teaching children about the Bible! Thanks Abbie for the nice comment! I appreciate your visit! This is a lovely lapbook, thank you so much. Resources are so expensive here in South Africa, so I really appreciate these. We used the Judges lapbook today. Hard to find activities elsewhere, and yours are perfect. We printed out all of it, and bits were suitablefor each age. I like that it has a balance of writing space and ready-made pictures, cutting down the work for the child a bit. Your colors came out so nicely on my printer too. Thanks so much for the nice comment! Glad you could use the project and I appreciate you stopping by! I've clicked on come of the site to print off your things and it won't come up https://drive.google.com/file/d/0B3uNEVAAKowpbzhQVUpVZHZPU3c/edit?usp=sharing Our little congregation doesn't have anything put a black and white printer. I go through a lot of ink printing my things in color. I have printed some of the things in black and white and let the kids color it but don't like using a lot of time for them to color when I can teach them more on the lesson. I love your ideas and haven't done any of the lap books as I haven't understood how to make them yet. some looks like they are folders and others look like a booklets put together am studying your page on lap books. I love this, but was wondering where is Abimelech? Hello, this is an answer I added to the Judges blog post as to why I didn't add hi. There is more if you'd like to check the post, and in a couple of days, I will add more. Even though I didn't add him as a judge, I did change the bulletin board posters and lapbook to include him for those that feel he was a judge after studying the scriptures. I will try to add the worksheet also in a couple of weeks, as I am short on time at the moment. After a lot of study on the judges, I did not add Abimelech as a judge. But decided to add this comment as to why. after several comments. My main reason is the Bible verse: Nevertheless, the Lord raised up judges who delivered them out of the hand of those who plundered them. Judges 2:16 God picked who He wanted as the judges, and the first couple of verses of chapter 9 tell us that he talked his way into being a leader, and is made 'king' by the men of Shechem (9:6). In verse 22, we are told that Abimelech ruled for 3 years. Again, he was self appointed and considered himself a ruler. After a lot of time spent on this, I can't get past the fact that God didn't pick him to be a judge. Thanks for the comment, and I appreciate you stopping by! Thanks Abbey, I appreciate your cokmment and visit! 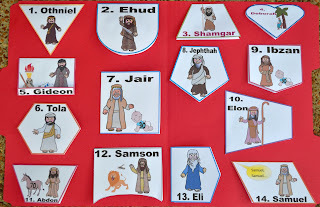 Can you tell me where I can find the printable Lapbook that includes Abimelech? Love your work! Ellen, sorry, I did not include him in the printables for the reasons above. I realize that some people do include him and some don't. My conclusion came from a LOT of study and I just couldn't get past the fact that God did not pick him. God picked all the judges: My main reason is because he was a self appointed bully (Judges 9:1-2) and God didn't pick him (Judges 2:16). Thanks for stopping by. How do you use the Judges Lapbook? Do you put questions under the picture flap of each Judge or is it just to help them remember the names of the Judges? Jane, one of the great things about lapbooks, is you can use them and lay them out any way that works for you! I personally had the students write the information we discussed for each judge under the correct flap. It can be used as you are teaching the lesson, or as a review. Thanks for stopping by! I appreciate it. Wow, this is GREAT WORK!!! Thank you for all the time you put into this amazing! Look for the new post tomorrow with the Judges Trading Cards. THANK YOU SO MUCH for your time and dedication!!! Your website is a real godsend for some of us brand new Sunday School teachers,and thank you for sharing all this information!May God bless you greatly!! 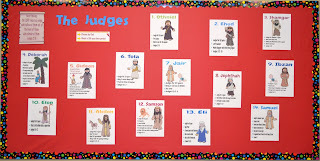 I love the Judges bulletin board idea- do you have a printout of these that includes Abimelech? Sorry, I did not include him in the printables for the reasons in the post above. I realize that some people do include him and some don't. My conclusion came from a LOT of study and I just couldn't get past the fact that God did not pick him. God picked all the judges: My main reason is because he was a self appointed bully (Judges 9:1-2) and God didn't pick him (Judges 2:16). Thanks for stopping by. Is there a reason you left out Abimalech? the spelling of Lappidoth (Deborah's husband is spelled incorrectly (Lapidoth) on the page about Deborah. Patricia, according to NKJV Judges 4:4, the spelling is Lapidoth, so I won't be changing the spelling on this one. Thank you though.